The Altar Society and Church Environment Committee are separate ministries, but work together as a team under the guidance of the Holy Spirit and our Pastor to help enhance worship at Saint Frances Cabrini Church by devoting time and talent while cleaning and decorating our church, vestibule, sacristy, chapel, altar and sanctuary to promote the glory of God and enhance the celebration of the liturgy. We invite parishioners to join either or both of these ministries. Men are welcome and encouraged to join and help with the heavier duties. We do have families who come and work together. 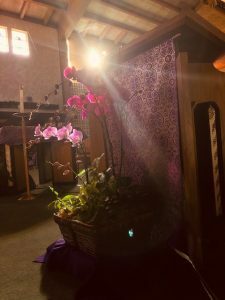 The Altar Society directs upkeep of our church and includes the care of candles, holy water fonts and baptismal font, plants and flowers, maintaining the altar linens, dusting, sweeping, polishing brass, care of the pews and decorating for liturgical seasons and holidays. It is an opportunity to share your ideas and talents and be blessed by God for maintaining and caring for God’s house. 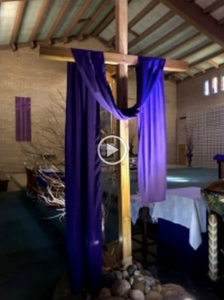 This ministry will help you to foster more reverence for the Holy House of God. The Environment Committee prepares and places the beautiful Holy Days, Feast Days and Church Seasons decorations that make SFC such a welcoming house of worship. For more information, contact Shirley Corbari, Altar Society Chairperson or Victoria Dove, Environment Committee Chairperson. 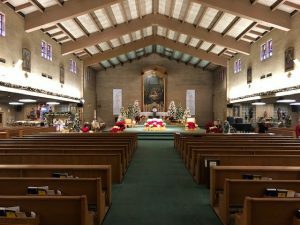 What’s it take to become an Altar Angel at St. Frances Cabrini Parish? The Altar Society & Church Environment Ministries invite new members to participate as we head to Fall and Winter Holiday Season. 6. Dust marble & linoleum floors as necessary in church and chapel. Contact Shirley Corbari for more information. Thank You Altar Angels for Your Efforts This Christmas Season! Thank you Jean O’Connell for submitting these photos. Special thanks to Shirley Corbari, Altar Society Chairperson and Victoria Dove, Environment Committee Chairperson.as well as all the Altar Angels who helped prepare our Church for this year’s Christmas celebrations. See all their work at here.